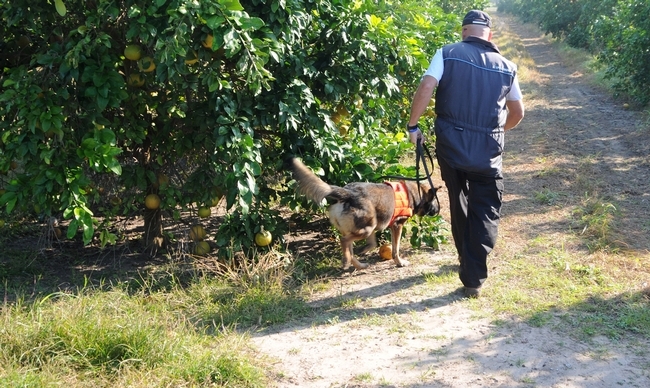 The Citrus Research Board is arranging to bring specially trained dogs to the UC Lindcove Research and Extension Center to test their ability to sniff out the devastating citrus disease huanglongbing, reported Bob Rodriguez in the Fresno Bee. CRB president Gary Schulz is working with the USDA, which is training dogs in Florida to identify trees with huanglongbing soon after the trees are infected. HLB has ravaged Florida's citrus industry. In California, the disease has been found about 800 Southern California backyard trees, but officials have so far managed to keep it out of the state's commercial orchards. "The USDA has invested million of dollars in detector dogs and they have proven to be a credible diagnostic tool for early detection and screening trees," Schulz said. HLB is spread by Asian citrus psyllids. Psyllids can pick up the the disease from infected trees and spread it to other trees as they feed. Symptoms may not show up in the tree until a year or two after it is infected. PCR (polymerase chain reaction) is the only way to positively identify huanglongbing infection in citrus. The process requires testing of many leaves or branches from the tree and may return a false negative if the samples selected for testing aren't infected, but other parts of the tree are. Schulz said the HLB-detection dogs will start their California work in the southern part of the state before traveling north.